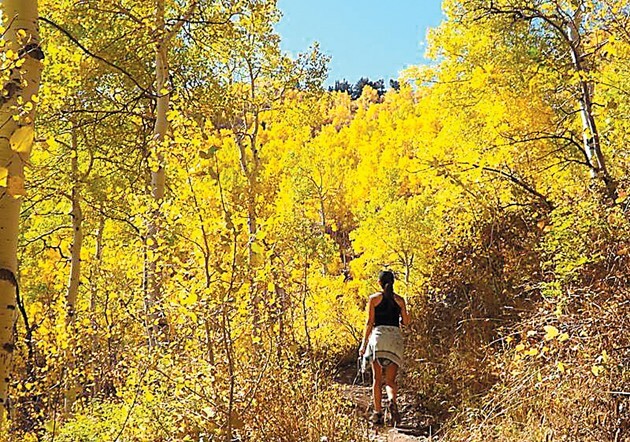 Mishelle Jessop hikes through the vivid fall colors of aspen trees. Autumn is a time of beauty, enjoyment and reflection. For me, it’s a time to walk in the forest where, for a few days, the light is different, leaves rustle in the breeze and the smell and chill of fall fills the air. We are fortunate in Utah to have many different places to see fall colors. Some of the best are close to Tooele City, like in Middle Canyon and up to the Oquirrh Overlook. Locals should take advantage before the road closes for the season on Nov. 1. 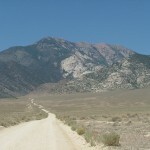 As you begin the climb to the overlook from Butterfield Pass, the view of 10,321-foot-high White Pine Mountain and the Butterfield Peaks is spectacular. The aspens there blaze out from between the evergreens. Follow Vine Street east from Tooele City and drive up Middle Canyon. At Butterfield Pass, turn left and drive to the top of West Mountain. Most vehicles can handle the drive on the gravel road, but be careful. Hidden splendor also awaits those who venture south to the East Tintic range and follow Black Rock or Miners canyons up to the Boulter Peak high country. This is 4X4 territory with miles and miles of two track that passes through stands of scrub oak and aspen that should be peaking right now. To the west, draws on the Sheeprock Mountains run like golden rivers as their bottoms and tiny stream courses are lined with aspens. The mountain vistas and autumn displays on the Alpine Loop, which wraps around Mount Timpanogos’ eastern side, are unforgettable. So too is the scenic Mt. Nebo byway further south above Payson. If you are fortunate to have the time to head down to central Utah, the Wasatch, Sevier, Kaparowits, Markagunt and Paunsaugunt Plateaus are beautiful beyond words. I will never forget back road adventures through Geyser Pass over Thousand Lake Mountain down into Capitol Reef, sleeping under a harvest moon on top of Boulder Mountain, or a carpet of yellow aspen leaves on my campsite in the crook of the Henry Mountains near Bull Creek Pass. There are so many places to go; but you must choose carefully because our lives are finite and so is the fall season. This fall, I chose to go back to a place where I camped once before: on the edge of a snowbank near the summit of Circle All Peak in Big Cottonwood Canyon. Looking east up at Nelson Peak from my house in Stansbury Park, I could tell that optimum colors would be on display in this area. 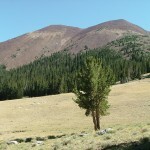 I imagined that Mill A Basin below 10,241 foot-high Mount Raymond would also be ablaze with color. 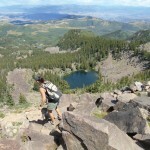 We drove the short distance to Big Cottonwood Canyon and up to the Butler Fork Trailhead. When my wife, Mishelle, and I go for a hike, we always like to bag a peak, so we decided on Mount Raymond and started hiking around 11:30 a.m. The first portion of the trail climbs steeply to a narrow canyon containing a small creek. Soon afterward, you’ll come to a trail junction. If you turn right, you can hike up to Dog Lake. Instead, we turned left towards Mill A Basin and climbed steeply up a drainage near a small stream for a ways until we came to a big gray rock on the right hand side of the trail. At this point, the trail begins a long series of short switchbacks to the summit of Circle All Peak. It is along this stretch that the aspen color was at its finest. Mishelle seemingly disappeared into a field of gold as she walked into the woods ahead of me. The tree trunks white bark, yellow leaves and clear, blue sky made for an incredible scene. Once on the Circle All ridge, the trail heads north to the base of 10,242 foot-high Gobbler’s knob where it meets a connecting trail. You can again turn right and follow this trail toward the Dog & Desolation Lake areas or you can turn left and head towards Mill A Basin. We turned left and followed the trail west as is skirted the base of Gobbler’s knob toward the basin. Just before it enters Mill A Basin at the foot of Mount Raymond peak, the trail splits again. The right fork heads up to Baker Pass at over 9,200 feet and the left fork heads into the basin where there are open meadows, small terminal moraines and stands of fir and pine. We took the right fork and headed north to Baker Pass which is the saddle between Mount Raymond and Gobbler’s Knob. From the pass we headed west to Raymond summit ridge, and this is where it gets serious. Steep inclines, broken rock knife ridges with gnarled, twisted and ancient limber pine cling to the crags. In some places there’s a path, in other places you go straight over the rock on all fours. There were different hues of aspen clonal groups — greens, orange, yellow, red and the darker reddish brown of the scrub oak. In places large groups of aspen had already dropped their leaves but were beautiful just the same. 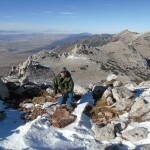 We finally emerged onto the summit at 2:30 p.m. gaining over 3,500 feet and covering 4 miles in the process. On the rocky, sharp summit of this peak, we were blessed with a clear 360-degree view of the central Wasatch Mountains during peak fall colors. There was a mailbox with notepaper and a pen in it, so we scrawled some thoughts, ate a hard-earned lunch and then headed down the mountain. If you are going to bag Mount Raymond, keep in mind that the portion of the trail beyond Baker Pass requires some scrambling and you will encounter exposure. The lower portions of the trail and the route to Dog Lake would be great options for kids to see some color. The colors still have a good week left. Challenge yourself to get out there and enjoy fall’s visual treat. Do it soon because as Robert Frost said, “nothing gold can stay.